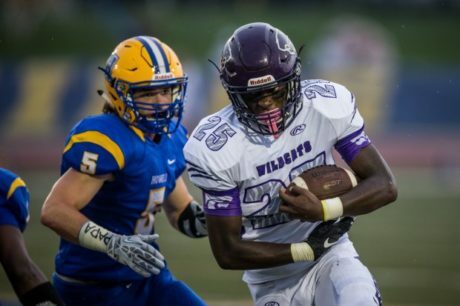 Eureka (MO) Eureka running back Hassan Haskins committed to Michigan on Sunday. He chose the Wolverines over offers from Memphis, Purdue, Wisconsin, and some MAC schools. Haskins is 6’1″, 202 lbs. He claims a 4.58 forty, a 4.1 shuttle, a 35.7″ vertical, and a 315 lb. bench press. Haskins was offered earlier this month after he was able to get his early-season senior film out to the coaches. He had been sitting on some lesser offers, but as soon as the Michigan offer came, the Wolverines jumped out front. He took an official visit to Ann Arbor for the Rutgers game this weekend and committed during the trip. I’ll probably take some flak for this because people don’t understand how words work, but from a running style standpoint, Haskins reminds me a lot of Adrian Peterson. He’s not as big or as strong or as fast, but he runs with the same style and idea of physicality. He’s not a blazing runner or amazingly elusive, but he has good vision and power. Michigan now has 15 players committed in the 2018 class with Haskins in the fold and Emil Ekiyor gone to Alabama. Haskins is the second running back in the 2018 group (joining Christian Turner), and he will follow a class with two runners (O’Maury Samuels, Kurt Taylor). Of the top four running backs on the roster, only one (Ty Isaac) will be gone by next season, so Haskins should have some time to develop before needing to see the field. He’s a little bit scrawny right now, but it looks like he has the frame to be a 6’1″, 220 lb. back by his third year or so. I have heard he is actually slotted to be a FB ? With Ben Mason seeing snaps behind the 2 seniors, could this indeed be true? We need more FB’s I would think? Thoughts? Seems like it would be a stretch at this point. Looks pretty skinny, and more skilled than a guy who will be resolved to play FB any time soon. Do you have Christian Turner moving to another position? I was tracking him as the other RB commitment in the 2018 class. I like that tape posted above. Kid seems to have a well-rounded skill-set. Runs hard for a lankier player. Makes nice cuts too. Probably a kid who could contribute elsewhere if RB does not work out. I prefer Turner but both look like they can make it with development and maturity. Both look like they have some vision which is much more important to me than blazing track speed. I agree, I like Turner more too. I think Haskins is a “piece” that Harbaugh can use but I was hoping for more difference makers, which I don’t think Haskins is. There is something to his stats. He can break some tackles and does have good vision. Wish he had more speed. He seems like a less-athletic AJ Dillon, who Thunder graded an 80. Overall, I’m not thrilled and would probably have graded him closer to 70 on this scale. Running backs don’t take long to make an impact in CFB so we should know within a couple years if he’s going to be good. I just wish UM made more attempts to steal other recruits that have higher ceilings than settle for Kurt Taylor’s of the running back world. Najee was so close, make more attempts at 1B options than this. Not that I mind, but the scouting report is a bit sparse compared to what I’m used to seeing here (extensive + and – blocks). Yep. I’m swamped during football season. So when commitments come during weekends when I’m doing game recaps and such, there just aren’t enough hours in the day.